Sempre que calço as meias que tricotei com esta lã da Retrosaria, os meus pés passeiam quentinhos. Tenho outros matizes para fazer e ainda gostaria de experimentar esta lã. Sou fã de meias tricotadas à mão! this yarn from Retrosaria I have my feet warm. I have other shades to make and I would still like to try this wool. I'm a huge fan of hand-knitted socks! Are they comfortable? I am looking for a really comfy sock pattern! They look great! I have not yet had the courage to attempt knitting socks. 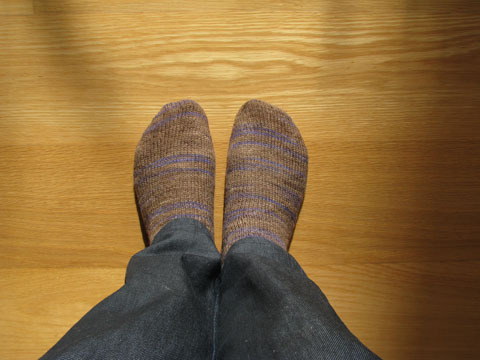 They are comfortable and I knitted the pattern that came with the yarn.